Posting a WordPress article on your website is important for attracting traffic. Here’s a quick and easy illustrated guide to posting articles in WordPress…. improving your ranking in search engines to attract more new prospects and customers who are interested in the topics you are writing about. So you took the plunge and invested in a blog for your website. Now what? Well, the success of your blog is largely determined by the articles you publish. Therefore, a good place to start is to learn how to post articles on your blog. To that end, we’ve created this tutorial explaining some blog posting basics. If you need assistance configuring or updating your WordPress website, we can help. Once you have an article written and ready to publish on your blog, log in to your WordPress account. Look for the “Posts” item in the sidebar, and click on it. Then click “Add New”. This is where you will create your WordPress article. Enter a title for the article on the first line. The title should be concise and descriptive (using keywords that are related to the contents of the article), and should pique the reader’s interest to draw them into reading the article. Enter the content for the article in the text box below the headline by either typing the text or cutting and pasting the text from a word processor. To cut and paste the text from a word processor, simply highlight the text in the word processor document and copy using Ctrl-C (Command-C on a Mac). Use Ctrl-V (Command-V on a Mac) to paste the content into the text box in WordPress. Formatting text (for example, making certain text bold) and turning text into links can be done using the tool bar above the text box. Save the article as “Draft” (the button is located on the top of the right-hand sidebar). You will want to keep it saved as Draft until the article has been completely written and formatted. When it is in Draft mode, only you can view it — it does not appear on the live website. Find the “Add Media” button above the formatting toolbar (just above the text box). Place your cursor in the article where you want the image to be inserted. 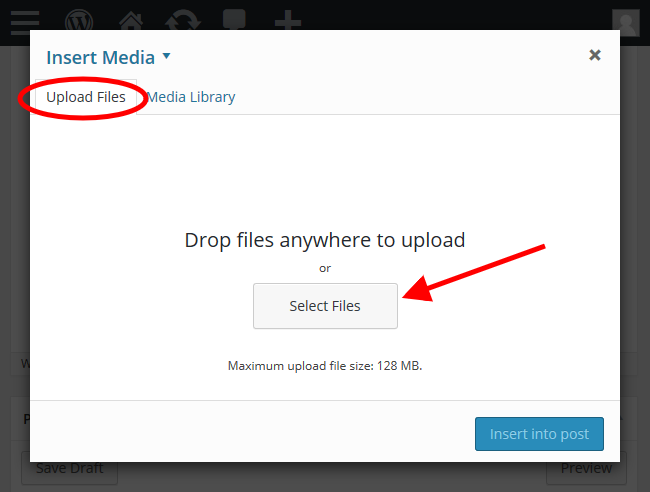 Click on the “Add Media” button and then click on the “Upload Files” tab on the next screen. 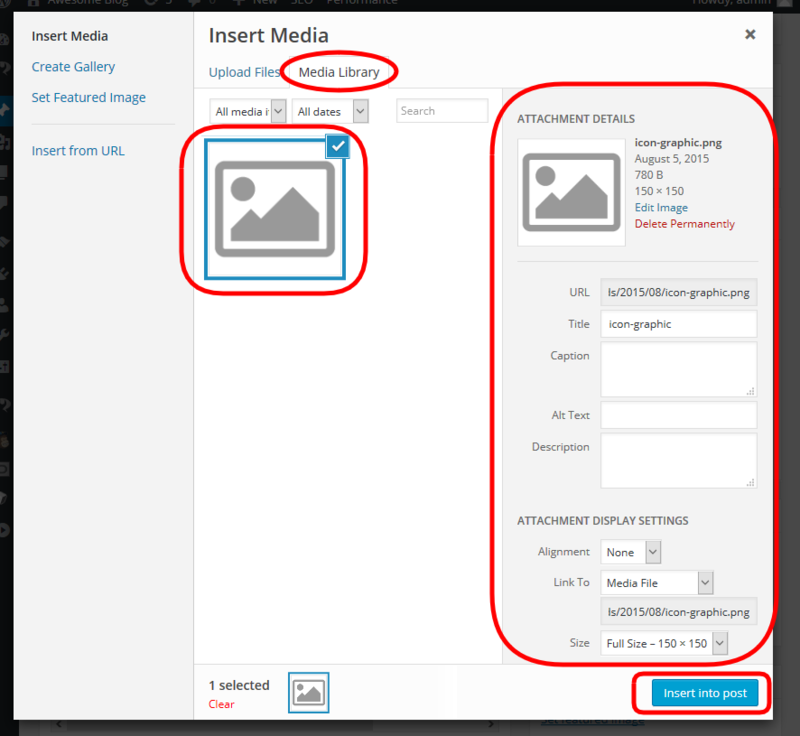 Follow the onscreen directions to find the image file on your computer and upload it to the Media Library in WordPress. Select the image from the Media Library, tweak the settings in the “Attachment Details” section, and click the “Insert into post” button in the lower-right of the screen. This will place the image into the article. 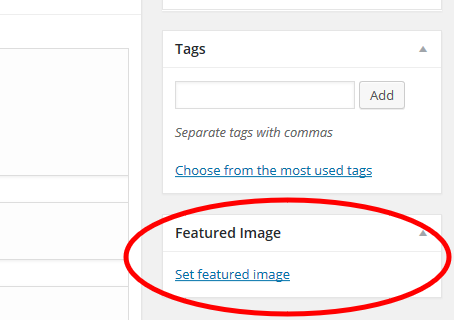 Each WordPress article should have a main image designated — called the “Featured Image.” This image usually appears at the top of the article as the large lead image, although this can vary depending on how your particular blog is designed. The Featured Image is also used in various other applications, including any social media sites where the article is shared. As such, it’s important to always include a Featured Image. The procedure for selecting a Featured Image is similar to adding an image into the body of your article. However, instead of clicking on the “Add Media” button, click on the “Set featured image” link located in the bottom-right of your screen. Then upload and/or select the image using the Media Library (same basic procedure as described in the Posting Images section above). Remember to save your draft after selecting a Featured Image, otherwise the Featured Image will not be saved. 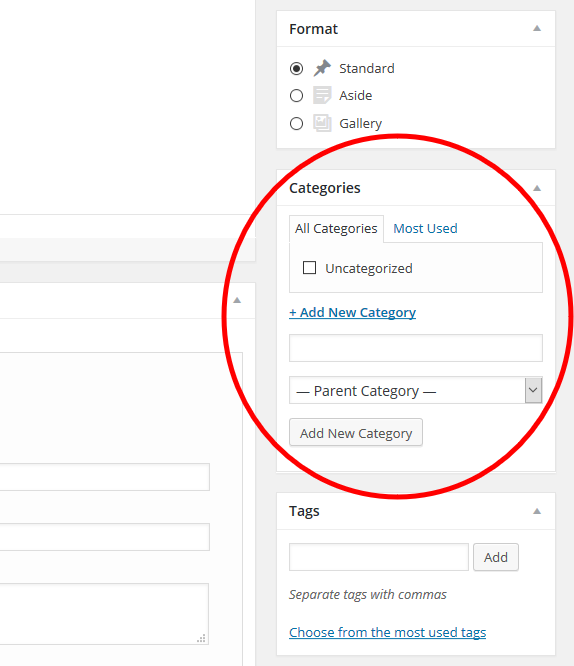 WordPress allows you to create categories and sort your articles into these categories. These categories can then be used to display articles to your readers grouped in meaningful ways. For example, if your blog is about food you can have several categories such as “appetizers,” “main courses” and “desserts.” Any article about appetizers would be assigned to the “appetizers” category, articles about main courses would be assigned to the “main courses” category, etc. WordPress also allows you to assign an article to more than one category. For instance, if you write an article that covers both appetizers and desserts, you can file it under both categories. Each WordPress article is required to be assigned to at least one category. By default, WordPress provides a category titled “uncategorized.” At first when your blog contains very few articles, you can simply assign them all to the “uncategorized” category. However, as soon as the number of articles on your blog starts to build up, take a look at how you can break them down into multiple categories, in alignment with the interests of your target audience. The longer you wait to create your categories, the more articles you will have and more daunting the task of re-assigning all your articles to the new categories will be. So don’t wait too long to start planning your category structure. If the category you want is already created, simple click on the checkbox next to the category name. You can assign as many categories as you want. If you need to create a new category, click the “+Add New Category” link. Then type in a new category name, select a parent category if you want to create a hierarchical structure, and click the “Add New Category” button. Note that if we have created a “Recommended Posts” sidebar widget for your blog, you choose which articles appear in that sidebar by selecting the “Recommended” category for the applicable articles. Tagging your WordPress article highlights keywords that are covered in the article and provides a way for your readers to find additional content on your blog about the same topic. Depending on the design of your blog, these tags can be displayed as clickable buttons at the end of your article, in the sidebar, or elsewhere. How are tags different from categories? Think of categories being broad general groupings and tags as more detailed groupings. For example, if your blog is on the topic of food, and you have set up categories for “appetizers,” “main courses” and “desserts”, you can then add tags that allow your readers to narrow in on what specifically they are interested in. You might create tags for each particular type of food: “artichoke,” “sauces,” “pasta,” “bread,” etc. Select tags that are relevant to your readers. Put some thought into your tags to make it easier for your readers to find all the content on your blog covering the same topic. Avoid tags that are too specific or similar to each other — combine them into a single tag. For example, instead of “penne rigate,” “rigatoni,” and “rotini,” consider using just one tag such as “pasta” that includes them all. On the other hand, be sure to not make tags too broad and general. Think of tags as a means of grouping your articles together by specific topic so readers can find related articles they are interested in. Make the tag too broad and too wide a variety of articles will be included in the grouping. Make the tag too specific and not enough articles will be included in the grouping. Find the sweet spot where the tags are meaningful to your readers and lead them to an adequate listing of related articles about each specific topic. To use a tag that has already been created previously, simply type it into the field in the exact same way as it was used previously (make sure you are consistent with spelling and whether it is plural or singular). 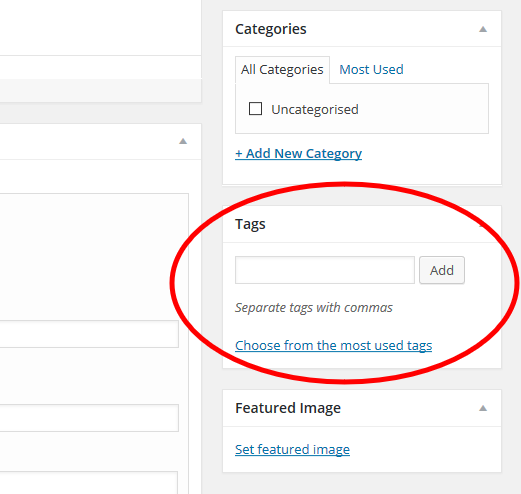 Click the “Choose from the most used tags” link to view common tags you have used previously. Remember to save your draft after adding tags, otherwise the tags will not be saved. When you entered the title of your WordPress article, you may have noticed that a new field labeled “Permalink” appeared directly under the title. The permalink is the web address of the article, and it plays an important role in how search engines rank your article in search results. Therefore, you should always check your permalink before publishing your article to make sure it is correct and optimized. 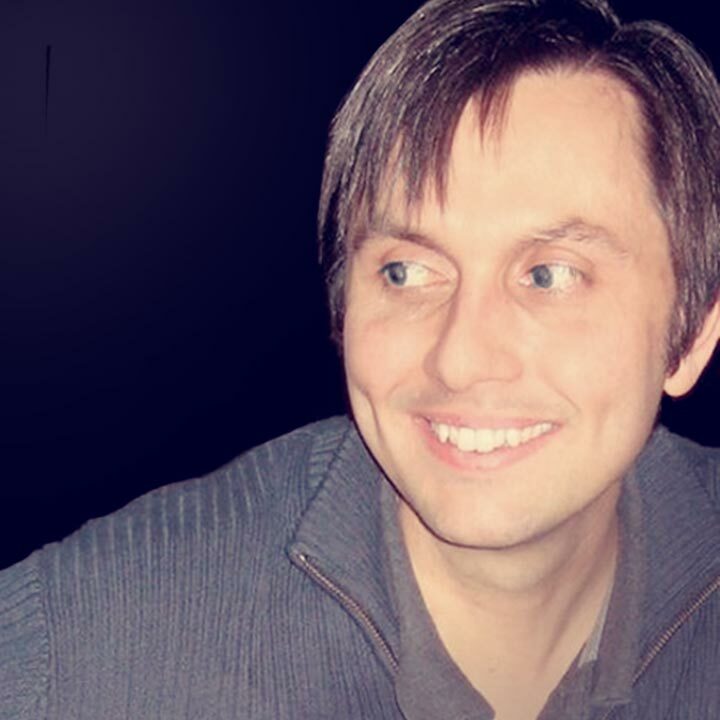 By default, WordPress will automatically create a permalink by copying the words from your title. It does this immediately once you leave the title field after typing your title, so if you only type part of your title (or change the title later), your permalink may be incomplete or incorrect. Also, note that using the automatically generated permalink might not be the optimal permalink for your article. Google has recommended that permalinks contain 3-5 keywords closely related to the article and that the most important keywords are placed first. Click the “Edit” button next to the permalink. Type in the Permalink the way you want it, using lowercase letters and dashes between the words (no spaces). Click the “OK” button next to the permalink field. Save your draft. If you don’t save it, the permalink will not be updated. 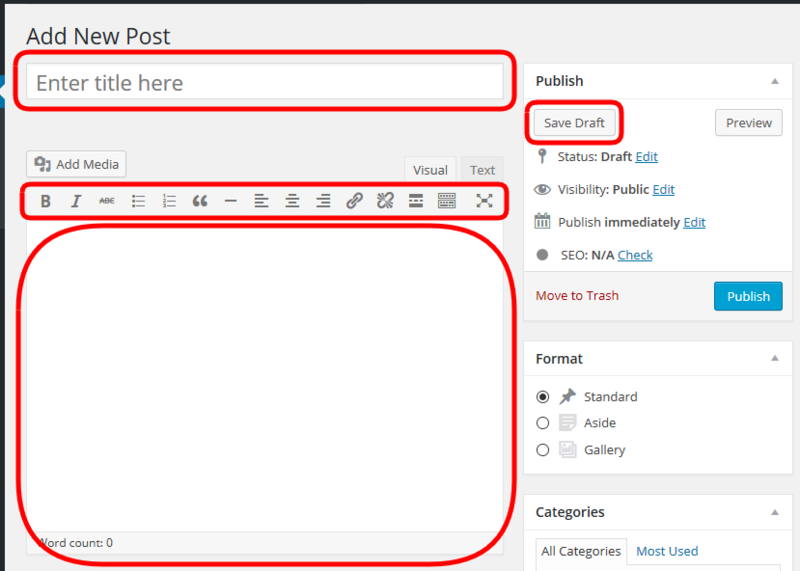 In addition to entering the article into WordPress, you will usually want to enter content in the “Excerpt” field underneath the main article text box. The excerpt is used in various ways depending on how your blog is designed, but in general it is used together with the Featured Image when displaying an article summary linked to your article (on your home page if you have articles appearing there, in the blog Search results, in the Archives pages, etc.). 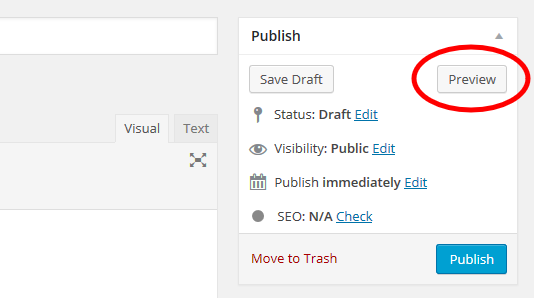 By default, WordPress will use the first 55 words of your article as the excerpt whenever it needs to display an excerpt. But these first 55 words may not be the best representation of what your article is about, and out of context they may also be confusing to the reader. You can specify your own excerpt text by filling in the “Excerpt” field. It’s generally a good idea to use text that summarizes the article and also “teases” the reader into clicking on the link to access the actual article. Remember to save your draft after adding your excerpt, otherwise the excerpt will not be saved. Now that you’ve filled in all the basic fields needed for your article, and you’ve formatted the content of the article the way you want it, it’s time to take a look at how the article will appear on your actual website. WordPress allows you to view it exactly as it will appear on your live blog before you publish it, so you can make any needed tweaks before publishing it on your live website for the world to see. Find the “Preview” button on the right-hand sidebar (next to “Save Draft”). Click the “Preview” button to view the page exactly as it will look on the live site after it is published. Review the article and formatting on the Preview screen in order to can catch any issues. Return to the Edit Post screen to edit/make any changes before publishing the article. If there is anything that you would like to change but can’t figure out, contact your Account Manager for further assistance. After you have verified that everything looks good with your article, it is ready to be published. You can publish it either immediately or schedule it for a specific time and date in the future. To publish it immediately, simply click the blue “Publish” button at the bottom of the Publish box (below the Save Draft and Preview buttons). 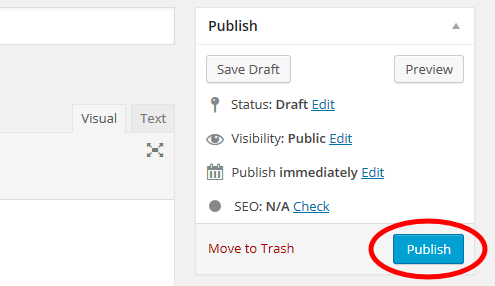 To schedule it for automatic publishing at a future time, click the “Edit” link next to the “Publish Immediately” item, in the section above the Publish button. Then select the date and time you want the article published. Note that the time is based on the whatever time zone your web server is set to. Don’t assume it is the same as your local time zone. Either test it to see when it actually publishes, or ask your network administrator or account manager to verify the time zone for you. Once you’ve set the date and time, click the “OK” button and then the blue “Schedule” button. 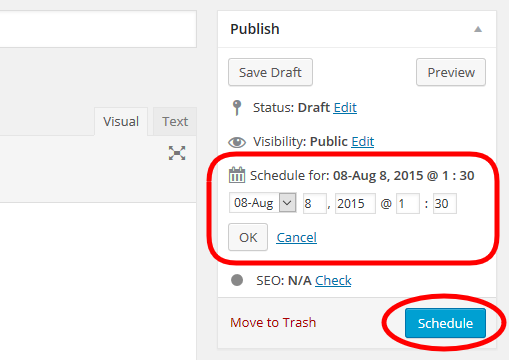 Your article is now scheduled for automatic posting at the date and time you’ve selected. 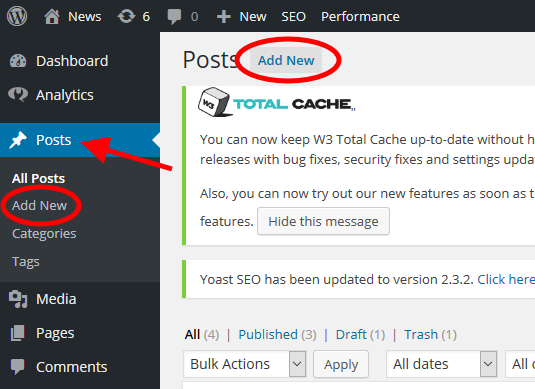 One other thing to be aware of is the caching system that is often installed for WordPress blogs. The caching system makes the pages load faster. However, sometimes when changes are made to the posted articles, the cache will continue serving up the old page instead of the newly revised page. 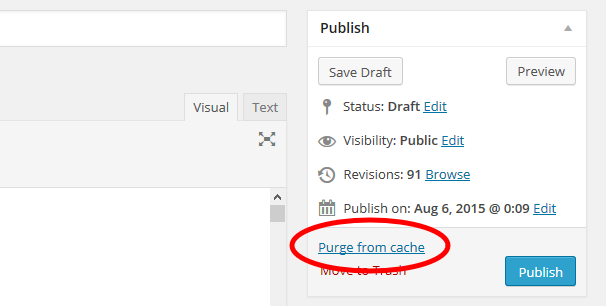 If this happens, click the “Purge from cache” link next to the “Publish” (or “Update”) button on the “Edit Post” page. This will clear that article out of the cache and your newly revised article will automatically replace it. So there you have it: the basics of how to post articles on your website with your WordPress blog. Keep in mind that the goal is to publish high quality original content. Avoid the temptation to simply copy content from other sources or mass produce blog articles full of uninteresting fluff just to keep turning out a high volume of content. Strive for quality, more so than quantity, and your blog will soon become a valuable asset to your website and your business. If you need any assistance with writing and publishing high quality content, contact your account manager, who will assist you in getting the most out of your blog. Got questions or comments? Join the conversation!